Work from home jobs aren’t all survey sites and freelance gigs. While side hustling and freelancing are great ways to earn a living from home, they don’t make sense for everyone. Instead, you may need something a little more substantial like a full-time work from home job that actually pays your bills each month. Sound about right? No problem! As it so happens, there are a number of companies that offer a chance to escape your cubicle in favor of remote work. And many of them are (almost) always hiring. The brilliant minds behind WordPress and popular plugins like Jetpack and Akismet also happen to be a remote-friendly place to work. In fact, the entire company runs without offices or emails. Impressive, right? Head on over to the Automattic Hiring Page to see what positions are available at any given time. Chances are, there’s at least a handful of full-time remote careers posted. Two of my favorites include Happiness Engineer and Code Wrangler. As a blogger (and one-woman show), I use automation tools to help keep things running as smoothly as possible. One of my favs is Buffer, a social media scheduler. And, it just so happens, Buffer is a company that has built remote work into their company’s culture. A visit to their Buffer Journey page gives you a chance to learn about current openings and how the entire team makes it work while working remotely. You can also check out their amazing benefits like unlimited vacay days, free books, and company retreats! Want to work with the top 1% of talent from around the world? You can when you get hired on at Crossover. You never know what openings you’ll come across on the Crossover Now Hiring page. Call Center Concierge, QA Tester, and Account Executive are just a few of the full-time work from home jobs available worldwide. Contract with LiveOps and create your own full-time work from home job! As a LiveOps Independent Agent, you get to be your own boss. Agents work on any number of projects on a contract basis — the choice is yours! Projects include everything from insurance claims to tech support and everything in between. To learn more about the Independent Agent opportunities, check out their FAQ page. 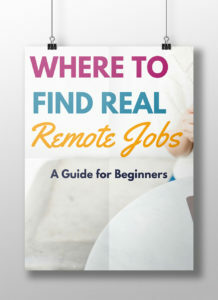 Apple is well known for their iPhones, iPads, and Macs, but did you also know they regularly hire remote workers as part of their Home Advisor program? It’s true! As an at-home agent, you can help Apple customers with billing, support issues or general questions they may have. There are even opportunities to work as a chat agent for their popular iTunes platform. Stop by the Apple Home Advisor homepage to learn everything about this full-time work from home job opportunity. And when you’re ready to apply, remember to give your resume a remote-friendly makeover to increase your chances of getting an interview! Work for social media startup Meet Edgar and join the small but growing team of remote workers who get to call an octopus their boss (check out their logo!). As the only social schedule that fills your queue for you, bloggers and small businesses are jumping on the Edgar bandwagon, which means continued growth and even more work from home opportunities for you. Learn more about the unique way Meet Edgar works and check out their current openings on their We’re Hiring page. If you’re an AmEx cardholder, you know the perks associated with your plastic. And if you’ve ever cashed in your travel rewards or had a question about your benefits or billing, chances are you spoke with an agent who was working from home. That’s right. American Express has a virtual call center set up for employees who want to work remotely. Virtual career opportunities at American Express typically include their travel agent program and general customer support positions. Whichever option is best suited to you, you’ll enjoy some notable benefits and schedule flexibility. Read up on the at-home options available at American Express by stopping by their Virtual Career Opportunities page. The Zapier team is made up of humans who believe that computers should do more work. Sound like your kind of people? You can join them! Zapier typically has a number of full-time work from home jobs with AMAZING benefits (mandatory vacation! ), available on their Hiring Page. If you want to learn even more and pick up a few nuggets of remote work wisdom, you must read Zapier’s Ultimate Guide to Remote Work. When you want to work from home full time but need a flexible schedule, consider contracting with NexRep! As an Agent, you can set your own schedule and work on a number of different projects that suit your interests. Visit their Agent Opportunities page to learn more about the job and which projects are currently available. Online auto sales, As Seen On TV Inbound sales, and Priceline customer support are just a few of their more popular agent opportunities! If you want to share code, collaborate with others, or work on some programming projects, GitHub is where you go. When you join the team, you can help make collaboration even better! Don’t worry, you don’t necessarily have to be a developer to get on the GitHub remote team! A quick visit to their Career Page and you’ll quickly see that available positions include marketing, sales and even internship opportunities! Want to work from home full-time advocating for brands you probably already know and trust? If you just answered with a resounding, “Heck, yes,” then VIPdesk Connect may be the place for you. Some of their clients include big-name brands like Chanel, Bluefly, and HomeAdvisor. You’ll have to visit their Current Openings page to see what’s available at any give time. 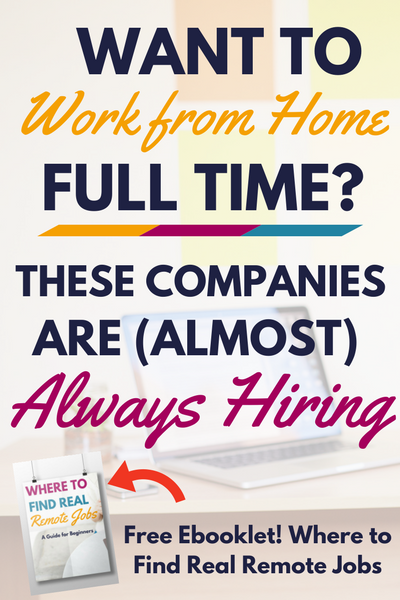 Of course, the companies listed here are just a small fraction of those offering full-time work from home jobs. To find even more — I’m talking dozens each day! — grab my free ebooklet. I’ll show you everything you can do to find real remote leads every day, many of them on autopilot! Just click on the image over there to the right and you’ll gain instant access! And, if you like what you read, go ahead and share it with others. The post Want to Work from Home Full Time? These Companies Are (Almost) Always Hiring appeared first on Work from Home Happiness.